We are one of the leading manufacturer, supplier & exporter of Dal Mill Machine. our other Products are Chemical Grinding Machine, Namkeen Making Machine, Noodle Making Machine, Packaging Machine. Backed by our rich industrial expertise, we make available Dal Mill Machine to our valued customers. 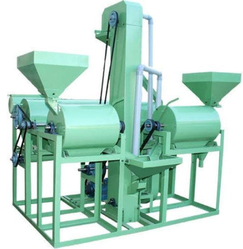 The offered machines are extensively utilized for grounding whole grains into flour. These machines are highly energy efficient and are characterized by high capacity, leading to high cost effectiveness for the customers. Being easy to operate and generating minimal noise while functioning, these machines are highly demanded by the customers. Backed by our rich industrial expertise, we make available Automatic Dal Mill Machine to our valued customers. The offered machines are extensively utilized for grounding whole grains into flour. These machines are highly energy efficient and are characterized by high capacity, leading to high cost-effectiveness for the customers. Being easy to operate and generating minimal noise while functioning, these machines are highly demanded by the customers. Backed by our rich industrial expertise, we make available Dal Milling Machine to our valued customers. The offered machines are extensively utilized for grounding whole grains into flour. These machines are highly energy efficient and are characterized by high capacity, leading to high cost-effectiveness for the customers. Being easy to operate and generating minimal noise while functioning, these machines are highly demanded by the customers. Backed by our rich industrial expertise, we make available Pulse Mill Machine to our valued customers. The offered machines are extensively utilized for grounding whole grains into flour. These machines are highly energy efficient and are characterized by high capacity, leading to high cost-effectiveness for the customers. Being easy to operate and generating minimal noise while functioning, these machines are highly demanded by the customers.